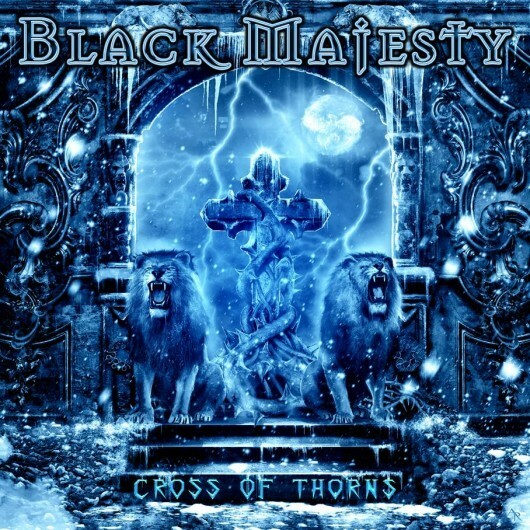 Easily the most accomplished Black Majesty album yet. A Melbourne-based five-piece; since their debut 'Sands Of Time' appeared a little over a decade ago, Black Majesty have slowly but surely grown into one of the more intriguing Melodic Power Metal bands on the current circuit. I like a kerosene-fuelled riff as much as the next man, but jeez far too many bands rely on that alone these days (and let's face it, few can touch DragonForce in that respect anyway) instead of significantly increasing their potential audience share by mixing things up a bit... a lesson that this lot (thankfully) learnt fairly early on I have to say. Follow-up to 2012's 'Stargazer' album, 'Cross Of Thorns' is their sixth album in twelve years and whilst the gap between releases has gotten a little longer of late, the quality of their songs has gotten consistently better over the years. Whether it's because they've always managed to maintain a strong melodic edge to their mixture of HammerFall, Helloween, Iron Maiden and Queensryche; whether it's because there's always a clearly discernible progressive undercurrent to their songs, or whether it's just because they're from Oz (and as such several steps removed from the peer pressure many of the European counterparts are subjected to all the time) is open to debate, but listening to BM is much more enjoyable than a lot of stuff coming out of the U.S. or European domestic scenes right now. So let's start with the riffs; the backbone of any Power Metal band. Lead guitarist Stevie Janevski and rhythm guitarist Hanny Mohammed have honed their partnership to the point where it's one of the most impressive I've heard in some time – scything riffs and simmering solo's flying at you from all angles yet they can also change it down a gear or two to suit the mood when required. In John Cavaliere they have one of the most melodic Metal front-men you'll find this side of Mike Vescera, whilst the rhythm section (bassist Evan Harris and drummer Ben Wignall) are once again an ever reliable engine room. But it's ultimately the strength of their songs that still really shines for me; this time more so than ever. Plenty of pomp and majesty in ribald gallops such as 'Phoenix', 'Escape' and 'Misery', but there's also plenty of passion and bombastic melodrama when they change tack slightly as they do on 'Crossroads' or 'Make Believe' – there is a nice cover of Gary Moore's classic 'Out In The Fields' by the way. All wrapped up in a powerful mix from longstanding friend Roland Grapow, 'Cross Of Thorns' is easily the most accomplished Black Majesty album yet.